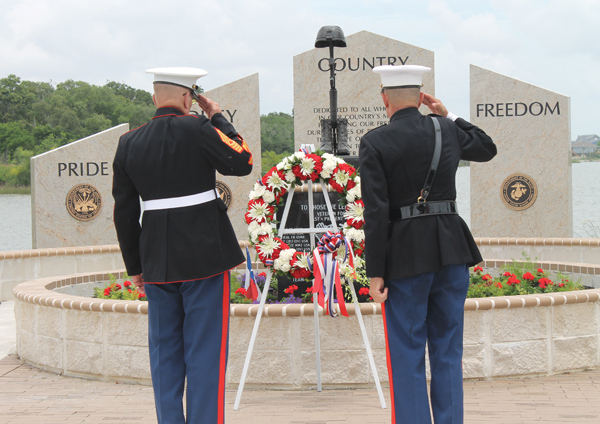 Marine Corps officers take part in the dedication ceremony. A crowd of several hundred were on hand May 25 for the dedication of the Bay Area Veterans Memorial – city officials, veterans and community leaders who worked to see the project come to fruition. There was a Bells of Dumblane bagpiper, a drummer, a bugler, a choir composed of Bay Elementary fourth and fifth graders, the Clear Lake JROTC Color Guard, Girl Scout Troop 1844 and the Sons of the American Revolution to add to the festivities. The Southeast Texas Patriot Guard Riders lined the street, along with military vehicles from the Bluebonnet Military Motor Pool in Pearland, as residents from Seabrook and the surrounding community arrived at the stately structure on Second Street in Seabrook. Jenny and Bruce Arunyon, who spent endless hours over the past three years planning and designing the project to honor our veterans, opened the ceremony. Rick Clapp, owner of Bay Area Houston Magazine, served as master of ceremonies, as the various organizations marched in to post the colors and raise the flag before band leader Pee Wee Bowen sang the National Anthem. Guest speakers included Maj. Gen. (Ret.) Dr. Jerry D. Icenhower, Fox 26 Morning News Anchor Natalie Bomke and World War II Army hero Birney “Chick’ Havey. Dr. Tony McCollum, pastor of Seabrook United Methodist Church, gave the invocation. A special guest was Lloyd Bornmann, a member of Navy Seal Team 5 and the Vietnam Pearl Harbor Survivor’s Association. Seabrook Mayor Glenn Royal assisted as the Arunyons presented the Veterans Memorial . They are now planning and raising funds for a third phase to the tribute to all who have served in the country’s military, they told the crowd. The ceremony came to an end with Sgt. Alfred Taylor playing Amazing Grace on the bagpipes, the benediction by Dr. McCollum, closing remarks by Emcee Clapp and Joe Machol playing Taps.